MOREHEAD CITY, N.C. -- Residents, meteorologists and emergency officials in eastern North Carolina were surveying the damage Saturday from multiple tornadoes that damaged more than 200 homes the previous day and sent more than a dozen people to the emergency room. The National Weather Service said Saturday that it confirmed an EF-3 tornado touched down in Beaufort County with winds estimated at 150 mph. It's the latest in the season that an EF-3 tornado or stronger has been recorded since records going back to 1950. In Halifax County, Antonio Richardson said the roof was blown off his home on Friday afternoon. He said he and a friend took shelter under his mobile home. "It peeled back my roof, just like you would a banana," Richardson told CBS affiliate WRAL-TV in Raleigh. Elsewhere, Texas, Oklahoma and other states in the Plains and Midwest were bracing for severe storms expected to start Saturday and continue overnight. There, the main threat will be large hail and damaging wind gusts. In North Carolina, Beaufort County Emergency Management Director John Pack said 16 people were taken to the emergency room when the storms passed through around 7:25 p.m. Friday. Pack said 200 homes were either heavily damaged or destroyed. 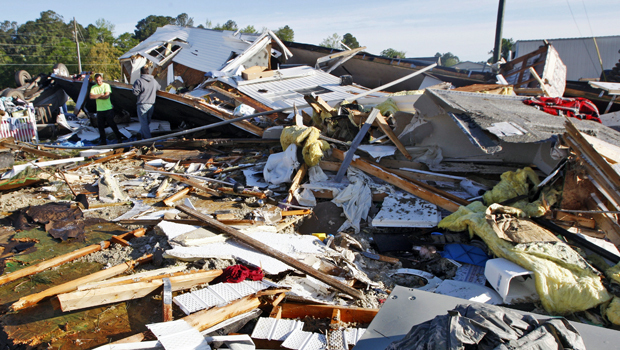 Pictures on news websites showed residents salvaging items from crushed mobile homes, along with snapped trees and a mangled utility pole in eastern North Carolina. "You can track the tornado by the damage." Pack said. "It left a lot damage behind in its approximately five to 10 minutes on the ground." Pack said the storm appeared to be about 300 yards wide and was on the ground for 10 miles. He said the line of damage started in the west-northwest portion of the county and traveled to the northeast. At one point, Pack said, 8,000 people were without power, but most had been restored by Saturday. Pack also said two major farming operations in the county sustained damages, but he didn't have further details.